Lesson Plan - a fun 45 minutes! On this site are loads of ideas, but how do you actually put them together to form a lesson? Well, over the last few years this type of structure "evolved" in my lessons to great success! 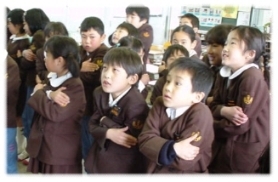 The idea is to get the kids back into a "Genki" way of learning, to get used to you again, to warm them up and to review the previous time's language. Start off with a quick go of the Warm Up game. Time depends on the class, from 30 seconds to 5 minutes. Then add in all the English you've taught in previous lessons. e.g. just ask them the questions and get them to answer. If they already know them, try a quick go of the lines game or the hammer game. Review the song from the previous lesson. They are singing and dancing and remembering the previous work all at the same time. Ideally you'd review all the songs you've done before, but we don't have time for that, so just the one from the previous lesson! We have two ways of doing this, a more modern "learn by making mistakes" way that gets the best results but can be a little uncomfortable for some teachers, or a more "traditional" way if you really don't like making mistakes. The teacher waits patiently - don't be tempted to jump in. Let them make the mistakes! 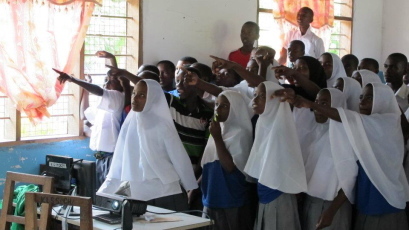 The class will turn into a football match with everyone shouting out the directions. *1 This has to be today's new theme, the first time the kids will have seen this English. Although of course if they already know the English we don't need to teach it again! 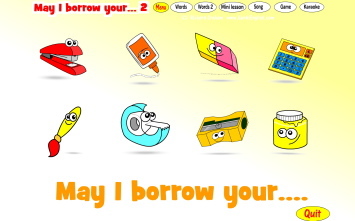 All the computer game have the complete phrases so you get not only the vocab but also the grammar of today's lesson. *2 If you are in the homework programme you set this for homework the week before. *3 If you're lucky enough to have tablets with Genki English for every child, they do the game on their own tablet. For the rest of us we use one computer at the front plugged into a TV or projector. *4 This is a great reward to offer for good behavior in previous lessons. *5 It's very important the controller only moves the cursor when the other kids tell them to, if they move on their own there's no learning for the other kids. If the controller has trouble with this, tell them they are a robot and can only move with commands from their friends! *6 If you've not done the left & right lesson yet, the kids can say this in their own language. But it's very important they don't shout out translations of the vocab items, the idea is to create a link between the spoken English from the computer and the pictures on screen. *7 This is the hard part for teachers! :) Have patience and don't be tempted to jump in when they make mistakes. Relax and let them learn. Believe me you will want to give up part way through. But KEEP GOING! It takes time and you'll love it. Or if you want to have the experience yourself try one of the Genki Thai or Genki Spanish lessons that you don't know yet! We need to make sure the kids understand what they have just learnt. Play each vocab item and get the kids to repeat. *Ask them* what they think each phrase means and make sure there are no misunderstandings. Ask them to think of gestures/actions for each vocab item - great for creativity, they come up with some crazy things! If you're not confident at singing (or want to rest your voice like I do) make sure to do the software "Mini Lesson" before the actual song. Use the "words" digital picture cards (or printed picture cards if you are really old school :) ) Hold one up, say the word and get the kids to say it back. Review often! After every 3 or 4 words, review the others. 8 words is a good quantity to teach in one lesson. Questions and answers are better. Say the question, point to a card and the kids answer. This is better than simply learning the vocab in isolation. Try tricking them by pointing to a card and saying a different question e.g. "What's your name?" To save time, try singing each word when introducing it. The melody and actions help the kids remember them more quickly. Plus when you've finished the words, they already know the song. Teach the song "a capella" using the "Mini Lesson" several times without the music. Keep practising till they know all the words! If they don't say things loud, do a competition between you and them to see who can say the word the loudest. Even the shy kids will be then saying the words! Sing the song with the music to make sure they know the vocab and have some fun! Keeping the music till the end makes sure the kids know the words and keeps the energy high. Here we want to recreate a real life speaking environment, complete with the heart fluttering nervousness that comes with speaking a foreign language for the first time. We do this with specially selected games. You can find the explanations for each game by clicking through to the lesson you want to teach on the curriculum page, or here are a few things to keep in mind. Only English is allowed for the kids, but the teacher should explain things in whichever language is most efficient. The less time you spend explaining, the more time the kids have to practise. Most of the games on this site can be used for almost any vocab. Try the Random Game button for some inspiration! But each lesson also has its own recommend game that gets the most speaking practice with the least amount of preparation. Pick a lesson from the curriculum and scroll down that lesson's page. To help with mixed level classes most of the recommended games are group/pair games. Explain the games by acting them out. All the games on the site can be explained in 2 or 3 minutes or less. If team teaching, try giving a translation of the game to the other teacher who can then explain the rules in the kids' native language. If there is no end to the game - do a big countdown! If everyone is having fun, everyone wins! If they don't win, it's simply another chance to try again next time. Do this and every kid will be wanting to keep going and learn more, especially if they actually lose a game! Sing today's song again and then the Thank You song to finish. Do a few claps and cheers. End the lesson on a high so they are looking forward to the next lesson! So there you go, a nicely structured lesson with plenty of chance to speak English and learn new language! Of course there are different ways to do this, and please feel free to vary, but this is the one that I used most often. You can see a lot of this in action in my free Online Video Workshop. Thoughts, comments or suggestions? Give me a mail. OK, choose a theme from the curriculum and get started!